The following lecture puts forth extensive information regarding Ménière’s Disease. Section one is primarily focused on the Overview of Ménière’s Disease. The educator starts off by giving an Introduction of this disease. Moreover, the Pathology of Ménière’s Disease is also highlighted. Furthermore, a thorough demonstration of Aetiology of Ménière’s Disease is provided. In section two, light is shed on Clinical Features of Ménière’s Disease. The educator extensively explains numerous Clinical Features of this disease such as Vertigo, Hearing Loss and a few Other Features. In section three, the educator talks about Diagnosis and Staging of Ménière’s Disease. Firstly, the educator elucidates the process of Diagnosis for Ménière’s Disease. Afterwards, light is shed on the Examination and Staging of Ménière’s Disease. 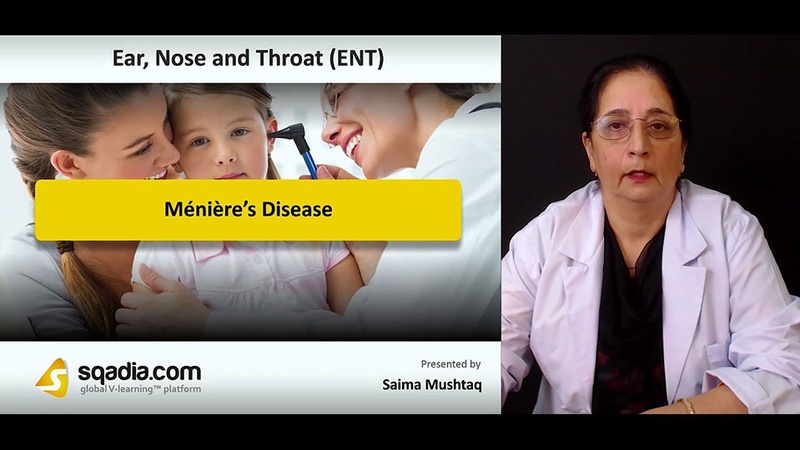 The educator then brings under consideration the Investigations carried out for Ménière’s Disease and puts forth comprehensive information about Special Audiometry Tests. Section four is devoted to the discussion about Variants of Ménière’s Disease. In the beginning, a thorough elucidation of Cochlear Hydrops and Vestibular Hydrops takes place. Subsequently, the educator deals with the demonstration of Drop Attacks and Lermoyez Syndrome. At the end of this section, the educator focuses on the explanation of Ménière’s Disease Vs Ménière’s Syndrome. Section five is about the Treatment of Ménière’s Disease. First of all, a comprehensive overview of Treatment is presented. Later, the educator brings under consideration Management of Acute Attack and Management of Chronic Phase. Moreover, the Intratympanic Gentamicin Therapy of Ménière’s Disease is highlighted followed by an elucidation of Microwick. Subsequently, the Surgical Treatment options in case of Ménière’s Disease are addressed.